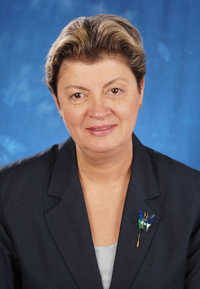 SIS professor Dr. Hermina Anghelescu is currently a visiting faculty member at the University of Tsukuba, School of Library, Information and Media Studies, Tsukuba-shi, Japan, where she is teaching a course entitled International and Comparative Librarianship. While in Japan Dr. Anghelescu has been asked to give a number of talks and presentations. She will give a presentation on November 29, 2017 entitled "Coming Out of the Cold War: from Censorship to Globalization in Romanian Libraries" at The Libraries of the Future Research, Inc., in Tokyo. She has also been invited to give the keynote address at a national conference on December 3 in Tokyo. The title of her address will be "School Library Media Specialists in the United States: Competency-Based Education in light of Accreditation Standards and Professional Development." The conference is called "The Concept of School Librarian in the Future: What Competencies Should We Nurture?" and is organized by the Japan Society of Library and Information Science (JSLIS), the Japan Library Association (JLA) and the School Library Association in Japan (SLAJ).